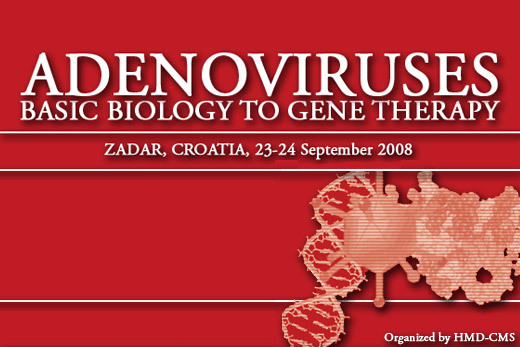 The main goal of this meeting is to provide PhD students and young postdocs with basic knowledge on adenovirus biology (virus replication and translation, pathogenesis, virus cell interactions), construction of adenovirus vectors (including the production of replication deficient vectors and packaging cell lines, the benefits and deficits of deletions of subsets or all the viral genes in the vector, the logic behind conditionally replicating adenoviruses), retargeting (transductional and translational targeting) and the use of Ads in the field of cancer gene therapy (interaction between Ads and the immune system including innate immunity, acquired immunity, and strategies for circumventing immune system barriers) and vaccination. Prominent lecturers from both European countries and Croatia have been invited. At the end of the meeting participants will be able to discuss the pros and cons of use of different Ads for gene therapy. The understanding of these topics will enable participants, with limited background in adenovirus biology, to find the potential value of Ads in their own work. We invite you to join this FEMS meeting to discuss the issues outlined above together with scientists who have “hands on” experience in this very exciting field. This should provide fruitful discussions on both sides. We hope we will meet you in Zadar.